Alison Bechdel gave Iowa City the pleasure of her presence at The Englert Theatre last night for Mission Creek 2016. Her lecture was poignant, tender, and intimate. Her fans, the full theater, brought as much emotion to the show as Bechdel herself did. The lecture moved lineally through her life as she consistently related her experiences back to drawing and writing. Bechdel brought her first attempts at drawing, which were projected behind her as she began describing her childhood. These projections bared a side of Bechdel that a majority of the packed theater had not seen. She did show panels from Fun Home and Are You My Mother?, her two renowned memoirs, but included cartoons from Dykes to Watch Out For as well as life-size drawings between the end of writing Fun Home and its’ publication. These childhood memories that she shared with the audience established an intimacy that I’ve rarely felt with a writer, let alone in a lecture. The drawings of a train, a complication with a man’s ticket, and the ensuing chase scene were incredibly simple and represented the time in which Bechdel’s drawing process was free-flowing and spontaneous. In addition to the drawings, she shared the daily diary entries that evolved into a “practice of OCD,” as she put it. She began to write “I think” between words, which expressed simple tasks throughout the day, due to a doubt in the truth value. Eventually, these entries developed into scribbles to an indecipherable point. She expressed how these entries lead into the complication of her drawing process as a whole; the exact opposite of a spontaneous child. Not only did Bechdel share moments of her life, the good and the bad, but she expressed how she persevered through depression. She touched on the idea of therapy as the catalyst for emotions. It wasn’t until her first session in which the therapist asks Bechdel if she’s mad about her father’s suicide. She says no immediately but then ponders. Ultimately, she considered the idea of feeling emotions fully. The life-size drawings mentioned above were a method through which to feel. They carried her through a break-up, her mother’s cancer, and the death of her cat, but not necessarily as a coping mechanism. She described them as drawings that utilized her full body, instead of her wrist and hand in comics, but also her full emotional capacity. 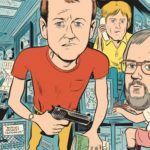 More than likely the lesser known of her works in a young audience is Dykes to Watch Out For, a series of comics displaying lesbians in a queer subculture. 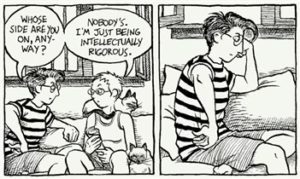 This comic strip for feminist media, prior to Fun Home and Are You My Mother?, expresses the opposite of the position in which Bechdel is situated by the media and the general public. 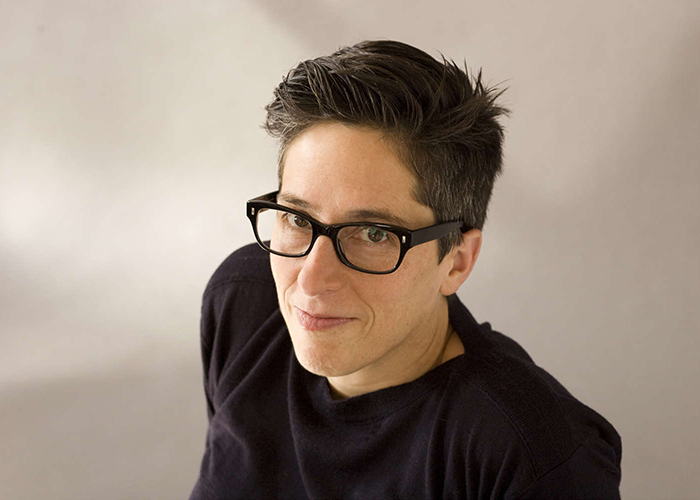 Bechdel discussed her time writing Dykes to Watch Out For. She had a menial temp job in New York and published these lesbian comics. Not just lesbian comics, but lesbian comics during a time when it wasn’t okay to be gay, illegal in fact. Her comics, published under her name, while being publicly “out” as a lesbian, was a political act in itself. She was at the center of the subculture. This queer subculture is strange to consider now. I attended the Q&A session just before her lecture. 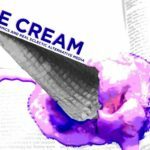 The same question was repeated, which was asked in several interviews as well: What do you think about being a part of the mainstream? This question is referring to The Bechdel test and its immense popularity. I mentioned my attendance at the lecture to acquaintances and a majority asked if she designed that test, which Bechdel actually shyly denies. I refer to this phenomena because Bechdel has a myriad of layers that the mainstream is ignorant to. Her familial history is relatable, as much as it is unfortunate, but was formative for the woman that stood before us. I believe it’s important to consider Bechdel’s talent and accomplishments other than a test that might have originated from Virginia Woolf anyway. 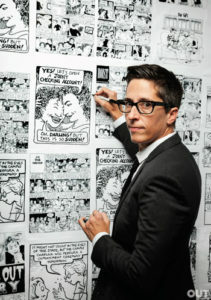 If you are interested in all things Alison Bechdel, please click here to be directed to her website where you will find comic strips, information about books, news, reviews, and more. 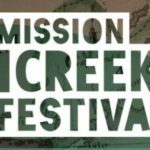 Check out more events during Mission Creek here.